Phi Phi Islands are part of a National Park situated extreme south of the hill chain of Phang Nga Bay, 34 km south-west from Phuket Island. Both islands are beautiful with green hills. One of them reaches 498 m above a strip of white sandy beach. From the sky it looks like a giant barbell. The tour around Phi Phi Don, the bigger of the two islands, is only 20 km. Phi Phi Islands are also the place where the movie “The Beach" was shot, which starred Leonardo Dicaprio. By speedboat or ferry, let yourself be seduced by this unique island, small piece of heaven. Similar to Halong Bay in Vietnam, Phang Nga Bay is for sure one of the most beautiful bays in the world! A tour by boat is a real must to explore the mangroves and to see the unique and magnificent panoramic views of 300 limestone formations. Years of erosion have created caves, tunnels and ceilings studded with stalactites and jungle covers the island over 100meters high. Phuket, the largest island of the kingdom, is an enchanting place where you will find everything for a wonderful holiday. Whether you are with friends or family, the variety of activities is endless. Phuket is the first destination of Southeast Asia and enjoys plenty of tours, shows, trekking, massage, food and other activities. From the pulsating nightlife of Patong to the religious architecture of Wat Chalong and the Big Buddha, Phuket is an island that combines extravagance and spirituality in a unique way that everyone should discover. Chao Lak is two hour’s drive from Phuket. Untouched by tourism, it is a mix of lush jungles and white sand beaches. Khao Lak is a peaceful tropical retreat for people who want a quiet and relaxing place to stay with some activities available to them. he province of Krabi offers a unique view of limestone rock formations similar to those in Phang-Nga. This idyllic area with powder-white beaches and stunning coral reefs is easy to reach from Phuket. Krabi has two sections, the town of Krabi and the beaches of Ao Nang and Railey where most of the hotels are. 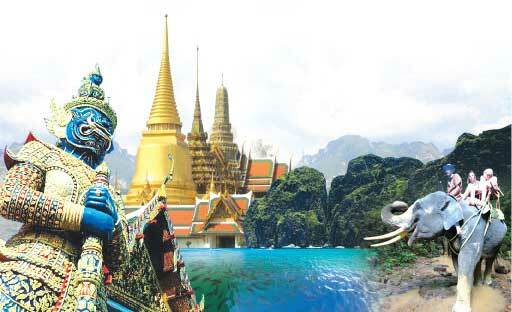 Krabi has become an alternative resort to Phuket. Today, it attracts visitors from all over the world including nature lovers, wildlife enthusiasts, thrill seekers and even those who prefer something more challenging. If you are looking for anything specific, please do not hesitate to contact us. Our experienced staff will be pleased to help you. Phuket surroundings offer a wide range of splendid small islands. Adored all over the world, Koh Phi Phi is of course the greatest one. But it would be unfortunate not to explore all the islands around Phuket. Facing less tourism, these treasures of southern Thailand such as Racha Yai, Koh Yao have remained authentic. By speedboat, ferry or longthai boat, half a day, a day or more, we have something for everyone’s taste. If you planning your holiday in Phuket, our Packages offers you a selection of well organised packages hotels/tours in Khao sok, krabi, Khao lak..Etc. Build your own Phuket holidays or find the best holiday packages in Phuket aera. Our company are tailor made then don't hesitate to conatct us.